There’s a certain mystique that surrounds the idea of “death.” It’s the end, the final chapter in the life you live. You often never take it seriously, simply worrying about the big and the small, the important and the trivial. But when you think about it, really, truly think about it, death isn’t something to be feared. It should act as a drive, as a kind of passion to do those things that you never thought you could. Are you passionate about writing? Awesome, go for it. Do you have the talent for the piano? Then give it your all. Strive to do everything you can now, because you might never be able to later. 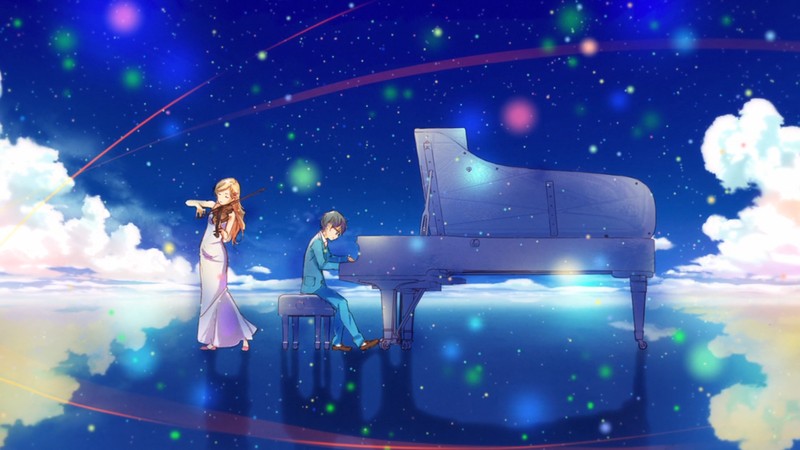 Taking this to heart, Your Lie in April springs off in spectacular fashion. 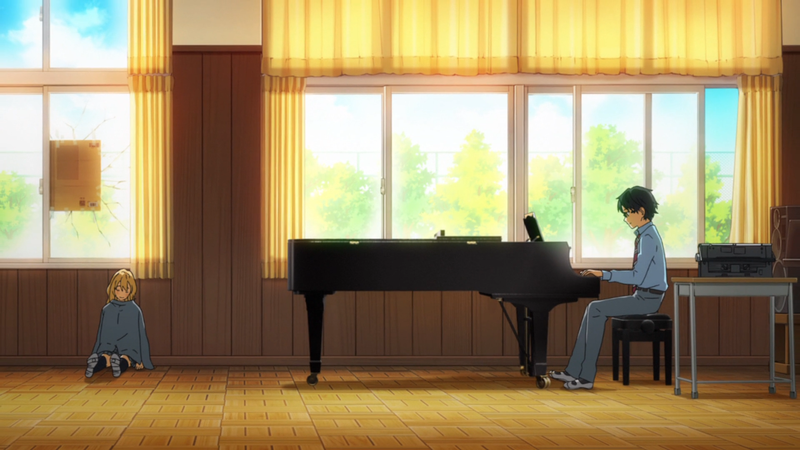 Shigatsu wa Kimi no Uso follows a young, junior-high-school boy named Kousei Arima who “can’t hear the piano” anymore. 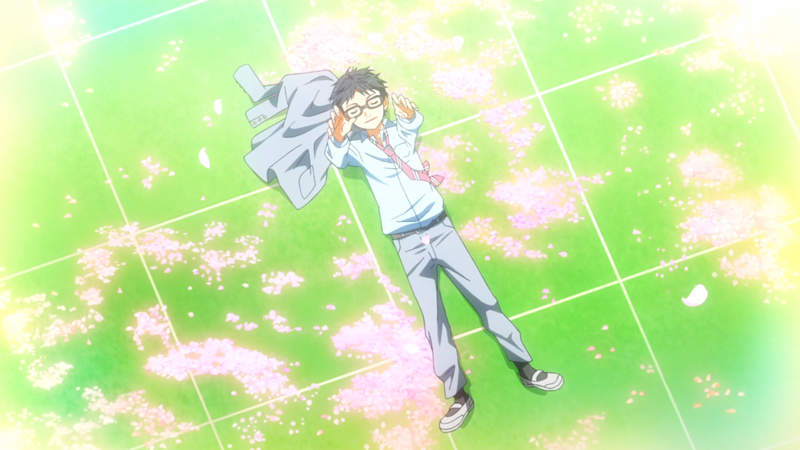 But on one cherry blossom-filled day in the park, Kousei meets Kaori Miyazono, and his life changes forevermore. Your Lie in April suffers from a rather apparent tonal issue. Tone in this sense is its ability to maintain a “correct” amount of emotion throughout given scenes or particular scenarios. And this begins quite early on. The show is first and foremost a drama. But it often swings back-and-forth with comedic moments in order to lighten or otherwise dampen the mood, should things start to get too heavy. The sad moments are melancholic and the happy moments are hilarious, but it often cannot stop itself from fully driving home those feelings during each of those particular situations. The problem is often exacerbated by the sometimes overdone and overly blatant death flags that litter the anime from start to finish. Furthermore, while certain measures in suspending one’s disbelief should be used during some of Kousei’s or the rest of the cast’s monologues, it becomes increasingly harder to do so when they’re ten or so years old in a flashback and expanding upon an internal soliloquy. Such jarring dialogue sounds powerful, but can occasionally cause the aforementioned tone to become further disjointed. Where Your Lie in April hits its tune, if you will, is in the story it tells. The first half of the anime is composed of Kousei’s rise from despondent child to forgiving son. Beyond just introducing the characters and the setting, what’s more noteworthy is in its ability to capture the sense that events or happenings in one’s past are not meant to control the life one has. Struggle and hardship are a commonality in anyone’s cycle of life; nobody is able to avoid difficulties. The solution, then, is trying to conquer such mute-filled points. And what is shown is meaningful: that it’s prudent for people to pitch in. It doesn’t matter if you are a young guy struggling with music or a young girl battling an illness; what the beginning demonstrates is that what matters most is being there for the person in need. The second half diverges slightly, in that it moves from showcasing support to showcasing parallelism. Throughout much of Your Lie in April, relationships and the connections that are established are obviously paramount. Thus, what begins to unravel as the show heads towards its conclusion are these various relationships being mirrored all over the place. Kousei is to Kaori as Tsubaki is to Kousei; Kousei the sensei teaches his pupil Nagi, as Kousei’s mother did with him; and his mother’s condition matches Kaori’s, and therefore affects him similarly. As with most parallelism, and which has already been alluded to, this does not mean it’s one-to-one. The difference being that each is healthier. Using these same examples: Tsubaki “confesses” to Kousei; Kousei respects and listens to Nagi; and Kaori’s death doesn’t spiral him into a black hole indefinitely but instead gives him the courage he’s always wanted. These are just a sample of such interconnected relationships, but each has the same effect: being both purposeful and worthwhile, for both the characters and the viewers at hand. Even after all this, the anime concludes with one more idea to ingest: that this was and is a romance tale. However, it’s very unorthodox, perhaps even surprisingly unfulfilling…or is it? Truth be told, Kousei never says those three little words to Kaori nor does Kaori say them to Kousei’s face. But like all of the other musical performances throughout the anime, they didn’t have to. Because their music did the talking for them. 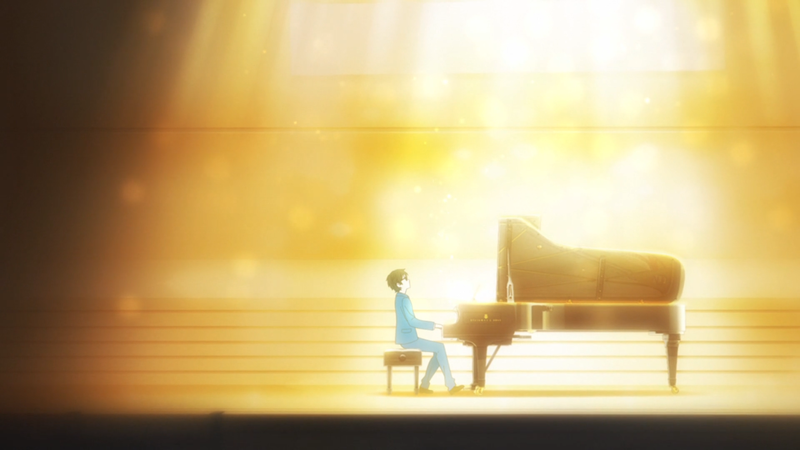 Emi’s passionate pleas resounded from her piano; Aiza’s determination to defeat his long-standing rival echoed throughout the stadium; and Kousei’s farewell to the mother he’s always feared emanated in a way that only a son could play. Therefore it is only fitting that the final performance be not one filled with selfishness, anger, or goodbyes; it’s a duet from the heart of the couple that never got to be. That entire segment, combined with the final letter, ends the anime in a perfectly poignant way. 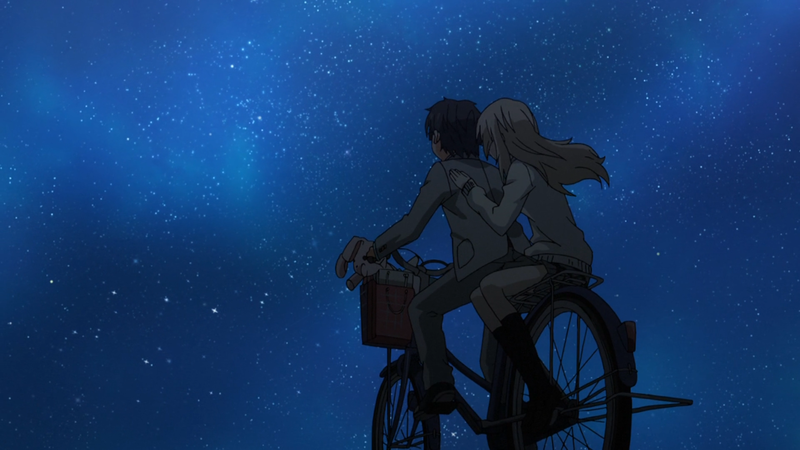 Your Lie in April is not only beautiful in the story it tells but also in the visuals it presents. The art for the anime is quite a spectacle to stare at; stare, not look, because it always captures your attention. The intricate lighting effects, the bountiful amount of colors, and the various locations visited either pop or sag when needed, attempting to make up for the loss in mood that the story inflicts upon itself. Also, the show incorporates a “minimalist” art style for both comedic effect and to help in limiting the already large amount of detail and animation flying around. Overall, such a tactic worked in its favor. The character designs also receive a heavy amount of detail. Kousei’s thick glasses, Kaori’s flowing yellow hair and multitude of outfits, and Tsubaki’s tomboyish attire are crisp and quite realistic. The anime also adds deft touches, such as giving the cast actual lips and having Kaori become paler the sicker she became. These niceties were not exactly needed, but having them included was definitely a boon. As for actual animation, it is very much above-average. Barring the previous jokey art style, the animation keeps up in all cases, with characters moving fluidly during walking, biking, or other normal activities. The high level of animation also persists throughout many of the performances, with the use of rotoscope when needed, increasing the total quality of the presentation that much higher. This is perhaps Your Lie in April’s weakest and most controversial department. Let’s begin with the bad: Watari and Tsubaki. Considered “mains,” they honestly don’t feel like ones. Watari barely has any impact, with his reason of inclusion to merely serve as a means to get to Kousei. While this revelation is given as the show is coming to a close — and is therefore fine in its use and placement, since it’s “her lie in April” — he does next to nothing to support Kousei or act like the “bro” he should. He acts as dead weight instead, from beginning to end, without providing any wisdom or notable messages. Tsubaki is a bit better, but not by much. Her complete understanding of Kousei is what keeps her away. She knows what he wants (Kaori and music), and also knows she can’t give him either of them. She therefore delegates herself into the classic “childhood friend” role, serving as supporter first and girlfriend last. Ostensibly, she is the person who gets him to realize his desires, but in reality, that’s just a front. That is, she projects herself onto Kousei, following in the same ideologies and self-deprecation that he does. And therefore we see similar development: she begins afraid, unsure even, of the emotions she has, goes through a period of doubt and “acceptance” of the situation she’s in, but eventually gains the courage to take that chance, to be the kind of person that Kousei needs now. She’s still supporting, sure, but no longer just to stay close; rather, it’s to get closer. Steadily climbing up the “good character” ladder, we land upon Kaori. As the energetic, bombastic, and supremely happy heroine of the anime, she personifies everything that Kousei wanted to be. Not just in terms of a musician, but in terms of a person. She gets to Kousei, unlike anyone had been able to for the past few years. And despite his complaining, his stagnation, and his outward depression, she doesn’t let up. Because that wouldn’t be her, that wouldn’t be true to herself. This is an important remark, due to what she tries to instill in Kousei throughout the entire anime. While she is understandably sidelined for half of the show, her influence on his life is still there. She hammers home the idea that you should be who you really are: a teacher, a musician, and most of all, a friend. She struggles, she fights, she never gives up; and while she may have passed peacefully, that same passion is thankfully not lost on Kousei. Reaching that top rung, Kousei Arima is discovered. Kind, sincere, yet troubled at heart, he starts in a rather unfavorable rut. But the development he experiences over the course of the anime is unquestionable. As the show depicts, it’s due to a culmination of all of the people he has met throughout his journey. Saki liberated, Tsubaki supported, Seto taught, Nagi foiled, and Remi and Aiza pushed; his adventure of finding himself is contrarily done by those around him. And guiding him along the way, never letting go of either his hand or her bow, is Kaori. She epitomizes what the rest of the cast did for Kousei: she too frees, supports, teaches, foils, and pushes him down the right path, towards the kind of life that would be worthwhile and whole. By the end, he isn’t the machine-like metronome; he’s simply Kousei. The first OP for Your Lie in April is fantastic. The drum beat, guitar, and trumpets work in unison, as do the vocalists, for the first part of the track. At the halfway point, the song picks up the tempo, and the entire piece flourishes. At this point, it brings you along for the ride alongside the dual singing. Before it ends, it skips daintily, closing on a nice note. The second OP is a small step down from the juggernaut that is the first, but it is still a good track. The quick-jumping and onomatopoeia-sounding lyrics make it fun and light, which is further supported by (the now standard) guitar-playing. Hitting halfway, the background singers and other instruments kick in, giving the song some power that finally ends quite peacefully. The first ED is happy, with simple singing and guitar-playing to start it off. Eventually, it garners a twinge of sadness, with the vocalist gaining some slight range as well. It’s a good piece that contrasts nicely with the drama of the show itself, but is the lowest of the four. The second ED is a departure from everything. The soft piano and singing is extremely sad. Accompanied by the slow guitar, it only makes the piece that much more disheartening. But the middle of the track becomes entirely hopeful, with stronger singing and stronger instruments. It ends happily, going against the song itself but not the anime it follows. The soundtrack is a monster as well. The flitting piece during triumphs, the mysterious record-track and one-note-beat combo during those unsure moments, and the water-like, ambient, piano playing track that accompanies thoughts of the past. And this says nothing of the powerful and emotional performances that are played throughout the entire anime. Everything is stunning, both in and out of the show. Finally, voice-acting is above-average for most of the cast. A special shout-out to Natsuki Hanae as Kousei with his wide range of acting and Risa Taneda as Kaori for her always cheerful and pepper way of speaking. For a drama, this anime is surprisingly filled with laughter. There are quite a few jokes, gags, comments, and situations that I found to always make me smile, if only to make myself forget about the tragedy surrounding it all. And I can’t overstate that last part enough: I cried at quite a few parts throughout. I even started crying while writing this piece. I don’t like goodbyes, at all; I cherish the family, friends, and loved ones I have in my life. So seeing it happen here really resonated with me. And I think this is important. While morbid, Kaori needed to die. Her living not only would have done a disservice to the story and to Kousei, but to everyone who was a part of the journey. Because as my introduction pointed out, death isn’t the end. There are so many more important things than dying: memories, relationships, even your favorite anime. Death isn’t the “be all, end all” to life. For as long as you are remembered, you never truly pass. While the closing of Your Lie in April brings with it a crushing sadness, there is light at the end of the tunnel for a reason. Light brings hope, fulfillment, and ultimately elation. 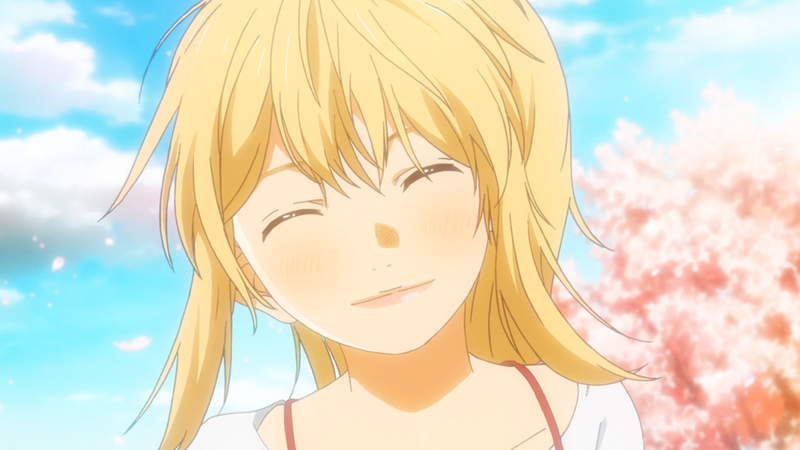 With a touching story, wonderful animation, and an astounding soundtrack, I’ll be taking Kaori’s final wishes to heart; I most certainly won’t forget.